SARASOTA, FLORIDA, September 17, 2018 – An infill of residential development is set to further enrich market choices of Sarasota homes for sale in the area west of Interstate 75 historically known as Fruitville. This new community now rising is called Fox Trace, a project of Houston-based David Weekley Homes. 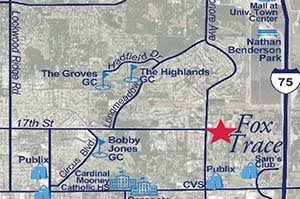 Fox Trace is located off 17th Street just across from the existing communities of Wyndham and The Woods. 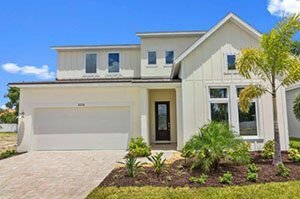 David Weekley, which also has several other homebuilding projects in Sarasota and Manatee, broke ground in August for the construction of its model home at Fox Trace. This residence will be just one of the 38 residences that David Weekley plans within Fox Trace. The home’s design features 2,100 square feet of living area designed with three bedrooms and two full baths plus a two-car garage. It will be fully-furnished when it becomes available for tours starting in winter 2018. David Weekley hasn’t announced pricing yet for its Fox Trace builds. But as the price points of model homes in its other local developments with similar square footages indicate, Fox Trace homes for sale should start at around the $300s. Fox Trace would be an exciting destination for prospective buyers searching for available residences in Sarasota’s bedroom communities, many of which are in this property’s Fruitville area. This locality has likewise seen some major improvements, thanks to the community alliance called Fruitville 210. This nonprofit was formed in 2007 to promote a stronger sense of community amongst Fruitville residents, business owners and county officials. Among the major improvements that Fruitville 210 has helped facilitate include infrastructure upgrades on the North Cattleman and Honore Avenue corridors, such as additional street lights and widened sidewalks. Other similar improvements have also been implemented in the Nathan Benderson Park and Rowing Facility. Much anticipated too, is the implementation of the planned $130 million Mote aquarium project at Nathan Benderson Park. David Weekley has already established a local presence in the Sarasota bedroom community of the Reserve at Honore. The current listings of Sarasota homes for sale include builds in this community, which measures between 2,100 and 3.050 square feet. Designed with three to four bedrooms; these new construction are priced starting from the $400s. The property turnover in the Fruitville area of Fox Trace in recent months has been fairly active, making its market debut quite timely. Four home resales were notched recently at the Wyndham neighborhood of this new David Weekley community. These recently sold Wyndham residences were built in the late 1990s and were listed with prices in the high $200s up to the $300s. These residences feature floor areas in the 1,600‒2,200-square-foot range designed with three bedrooms and two baths. Smaller residences of late 1980s vintage could be found at the Fruitville community of The Woods. Its available homes can sell within two weeks of their listing on the MLS of Sarasota homes for sale, because these are attractively priced starting from the low $200s. Well-built and well-maintained, these residences feature floor plans of about 1,500 square feet with three bedrooms and two baths.